The lovely Bettina from Little Old Souls kindly featured Sea and Salt last week. 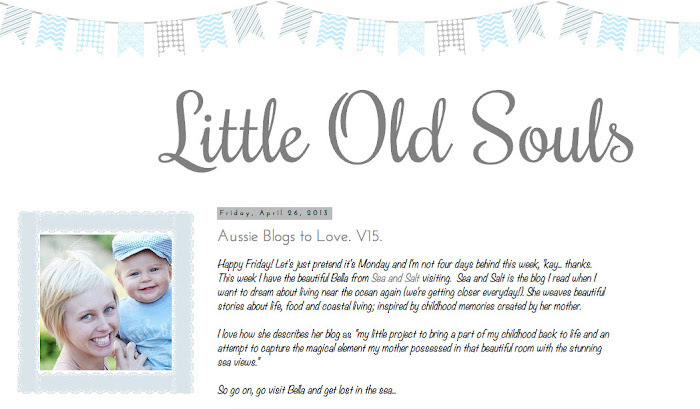 If you have a spare moment, you should splash on over to Bettina's Aussie Blogs to Love page where some of your favourite blogs may appear. If you're an Australian blogger, then the Aussie Blogs to Love group on Facebook may interest you (it's a closed group but you're more than welcome to join). New and seasoned bloggers gather to share wonderful tips, it's a genuinely friendly, supportive group and you may even make some new friends and add a few new blogs to your favourites. Next up on Sea and Salt... A delicious gluten free treat that I cannot wait to share!